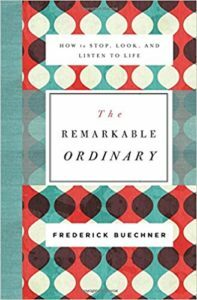 In The Remarkable Ordinary: How to Stop, Look, and Listen to Life, Frederick Buechner takes his readers on a journey to discover the story that God is writing through the everyday moments of their lives and how to share that story with others. This is a topic and theme that flows throughout many of Buechner’s writings, yet this book serves as an introductory approach to this important theme. These three major themes come together to help the readers both learn to explore their own personal story, look for God’s fingerprints on their own story and the stories of others, and sharing their stories in a clear way to others. Buechner has once again written a thoughtful and practically helpful book that takes his readers on a journey into their own story to see the God who is often at work behind the scenes.